I met Louise Danese Landry at one of the VIP events I attended in August, and noticed the lovely handbag she was carrying. Then I found out she’d not only stitched it, but printed the fabric for it as well! 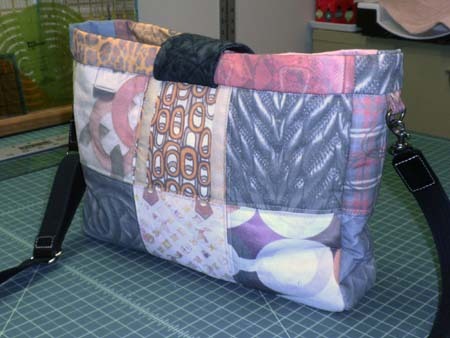 Here’s her story of making her “designer” handbag. A few days later I went to the mall to have my scissors sharpened at William Sonoma. I arrived early so I window-shopped at Coach, Gucci, and Louis Vuitton. Then the light went off in my head. 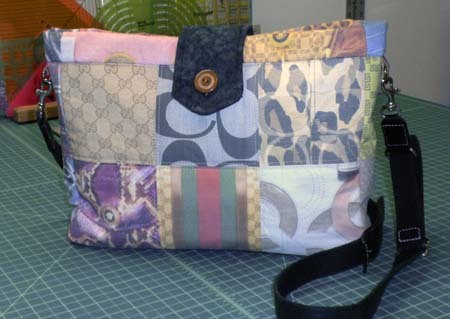 Why not make a purse with all these famous designers patterns, using the computer printer fabric sheets that I just re- found? I had a McCall’s purse pattern (#M4610) that I had made a few years earlier. One of its views had 6 patchwork type squares on the front and back, and two on each side. 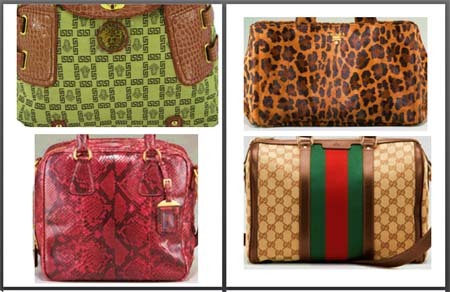 I captured images of designer bags from the Internet, then enlarged them. Since I made this purse for myself and have no intention of selling it or making any money, it’s my understanding there is no copyright infringement. Find the images you want to use, then press PrtScr (Print Screen) on your computer keyboard. This copies the whole screen to your computer’s Clipboard. Open a Word document and select Edit > Paste or press Ctrl + V on the keyboard. This pastes the image on the page. Click on the image, and the Picture Tools tab comes up at the top of your screen. Click it and then go to the right and click on Crop; black handles appear at each side and corner of the image. Slide them until only the part of the image you wish to use is inside the box. Click outside the dark area, and all you have left is the selected part of the image. Still under Picture Tools, select the Position tab. Select the center position. Click on the image and drag the corners to make it bigger. Repeat for additional images, filling the pages to use whole sheets of computer printer fabric. When everything is as you want it, print the pages. The only problem I had was getting the image to plot as good as it looked on my compouter screen. Every page I printed came out lighter or more washed-out looking; probably something to do with the ink cartridges. That’s something I still need to work on. But I still think they came out nicely. Follow the instructions for finishing the print. The computer printer fabric I used had to rest about two minutes after printing. Then I pulled the paper backing off and rinsed the fabric in cold water for two minutes. I laid it on a towel to dry overnight. The next day I cut out the pattern pieces and away I sewed! 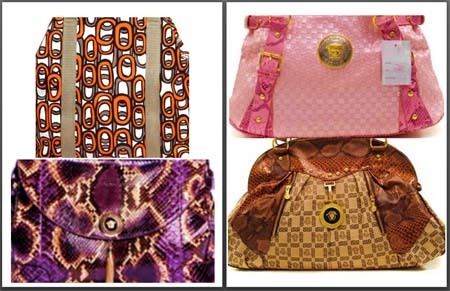 My sister said it is every woman’s dream handbag – five designers in one!